You use your water heater dozens of times a day, whether you think about it or not. Every time you go to wash your hands or take a shower, you expect the hot water to be there. If properly maintained, your water heater should provide hot water to your entire home without having problems. However, like any other piece of plumbing or heating equipment in your home, your water heater could have unexpected repair needs. When that happens, you’ll want to find a plumbing contractor you can trust to quickly resolve the issue and restore your hot water supply. 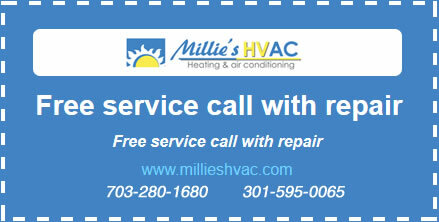 For water heater repair in Arlington, VA and the surrounding areas, call Millie’s Heating & Air Conditioning. We hire only qualified plumbers to ensure that you will not be without hot water for long whenever your water heater stops working. So whether you just need someone to perform regular water heater maintenance, or your water heater has suddenly stopped working, be sure to call Millie’s HVAC today. Even if your water heater is still working, there may be signs that repairs are needed. For instance, if your unit is not getting or keeping the water as hot as it used to, there is likely some underlying problem that needs to be addressed. You should also call us for a water heater service if you notice that the unit is making strange noises, or if it has stopped working altogether. We can handle all types of water heater repair or maintenance needs. Our experienced technicians will be out quickly after we receive your call to check out your system and make the necessary repairs. With the plumbers at Millie’s HVAC on the job, you can be sure your hot water will be back on as quickly as possible. During a routine water heater maintenance visit, one of our experts will go through your entire system to check for damaged or compromised parts and anything else that might cause an issue at some point in the future. We will also clean out any debris or sediment that has accumulated in your tank or tankless water heater over time. Call us any time to schedule an appointment. It is always a good idea to have a licensed professional perform and necessary water heater repair and maintenance services. The NATE–certified technicians at Millie’s HVAC know how to get the job done right, and we service all makes and models, whether it is a tank or tankless model. Call the experienced professionals at Millie’s Heating & Air Conditioning for all your Arlington, VA water heater repair needs!